Hi…today my recipe is for all those who celebrate their Valentine’s Day. 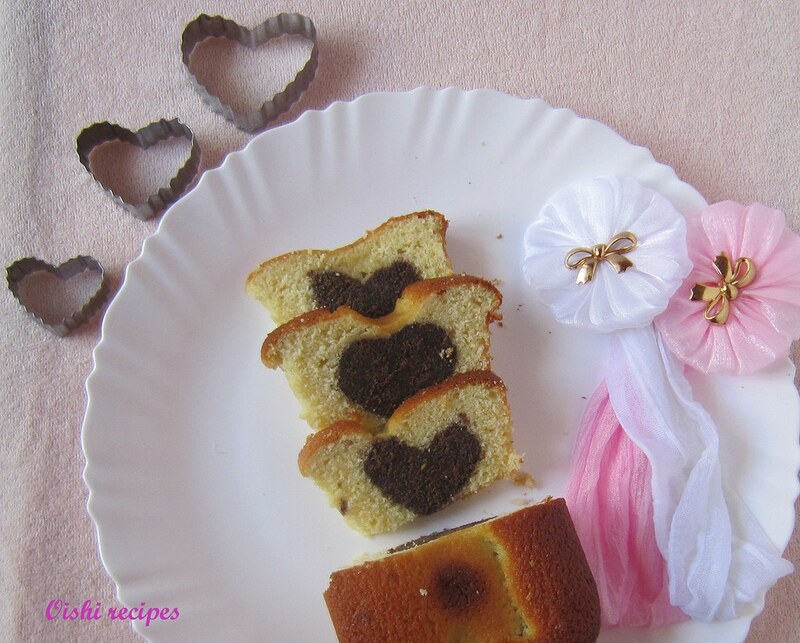 You can make this cake for your valentine and let them get surprised with this wonderful surprise heart cake. 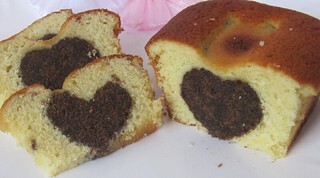 So celebrate this Valentine’s day with this surprise heart cake. Last month was our third wedding anniversary, I planned to make a cake for our anniversary. But unfortunately I was not not able to make cake. So I thought I should make on this Valentine Day. OK, something about the cake. 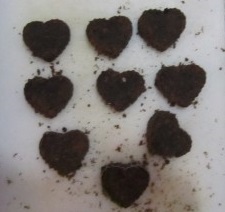 Here I made chocolate hearts. You can make any color hearts by adding food color. I thought of not to add any artificial colors because it is not good for us. So chocolate cake came into my mind. I am sure that you will like this cake very much and give this as a gift to your valentine. Celebrate this Valentine's day with this Valentine's / Surprise chocolate heart inside cake. Step 1 Preheat oven to 180 degree C , butter cake pan and then line the bottoms of the pan with wax paper, then spray the paper. In a bowl, beat the butter until soft and creamy. Then gradually add the sugar until light and fluffy. 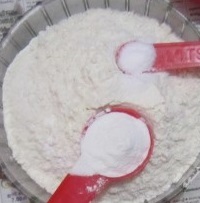 Prepare the flour mixture by sifting flour, salt and baking powder together. Add the vanilla essence, with the beater on low speed , alternately add the flour mixture(in 3 additions) and milk(2 additions), beginning and ending with the flour. 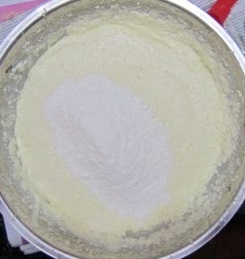 Divide the batter into two bowls. 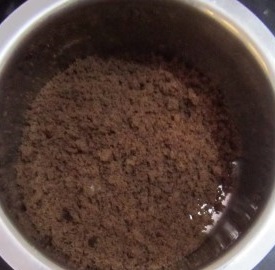 In one bowl add cocoa powder and beat well. 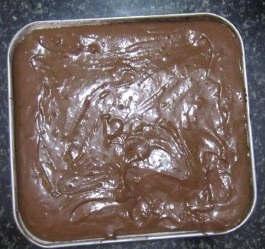 Now pour the brown batter in the prepared pan. Bake it for 15 minutes or until a toothpick inserted into the center of the cake comes out clean. Allow it to cool completely. 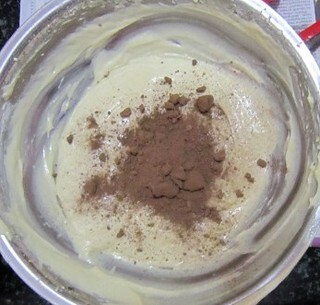 Now cut the cake into small pieces, put in a blender and powder it. 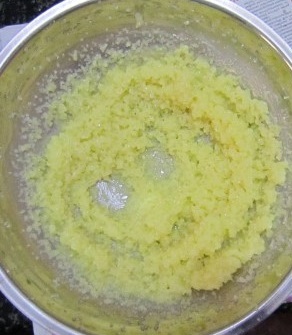 Now add a teaspoon of butter and lightly moisture the mixture. 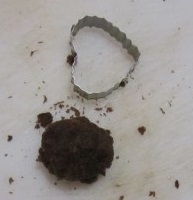 Place on the heart shaped cutter and press it. 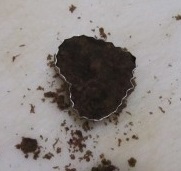 Gently remove the cutter, you can see the heart are formed. 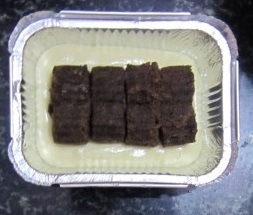 Take a rectangular aluminum tray and pour a tablespoon of white prepared early. Then arrange the hearts on behind the other on the longer side as shown in the figure. Now pour the white batter on top of it. Fill only two third of the tray. 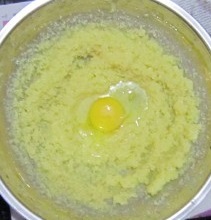 While baking the batter will rise and join all parts. Bake for 20 minutes or until a toothpick inserted into the center of the cake comes out clean. Allow it to cool completely. Cut into slices on shorter side. 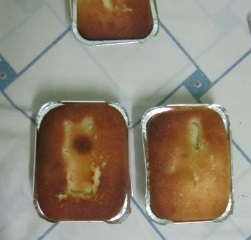 Now you can see the surprise hearts inside the cake. Instead of chocolate heart you can make any color hearts by adding food color into it. Okay that is a great cake idea. At first I was wondering how you did the perfect hearts inside the cake, seen the pics and thought now aren't you smart. I am thinking I could make a lot of cakes with shapes inside for the kids, what a surprise. Ooh this is so yummy and pretty! Thanks for the valentine idea, my kids will love it!